One cow looks much like another when they roam in their hundreds across the vast open plains of America. 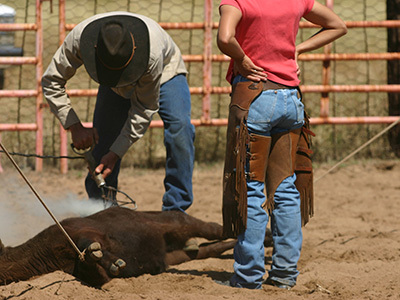 For hundreds of years, branding, in its original sense, was the only way to establish ownership of your cattle in the event of theft. But this is the literal kind of branding. 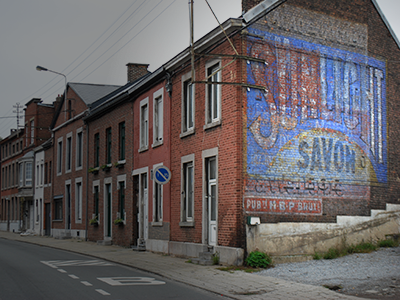 In the 19th century branding started to become the means whereby producers built up qualities such as trust and reputation in their products that we still recognise today. How does a brand establish itself? Initially the manufacturer’s name was used, such as Mr Cadbury’s cocoa, Mr Colman’s mustard, WD and HO Wills’s tobacco, Lipton’s tea, Fry’s chocolate – the list is long. At the same time colour (Ovaltine’s distinctive orange) and shape (Coca-Cola’s famous bottle) began to be used as a further means of recognition. The industrial revolution brought with it new forms of transport (canals and railways), new communication (the telegraph) and a new economy as the move from rural to urban living increased. Factories were increasingly able to make a wider variety of goods in greater volumes, and manufacturers realised that they could capitalise on this technology to expand both the range and diversity of their products. By the 1880s, as the variety of goods increased, there was an increasing need to differentiate between the goods on offer. There was a growing use of names that did not directly relate to the manufacturer. Identifiable names had to be developed to enhance the appeal of, for example, a soap, or create a distinctive image for a cigarette. Thus Mr Lever realised that a brand name like Sunlight soap could give his product greater sparkle and allure, and in the case of Wills’s cigarettes, Wild Woodbine or Cinderella gave the product exotic attributes. Around this time there was a trend for brand names to be invented which were essentially meaningless (Kodak). A further popular way of defining a new brand name was by simply using a final ‘o’ in the name – Oxo, Omo, Bisto. Here too were the beginnings of celebrity endorsement, emerging in such a brand as Oakey’s ‘Wellington’ knife polish (Wellington’s image appeared on the product, capitalising on his status as the hero of the battle of Waterloo). Amidst this proliferation of new names, manufacturers recognised the importance of continuity in their efforts to cement the quality and reputation of their products in consumers’ minds. 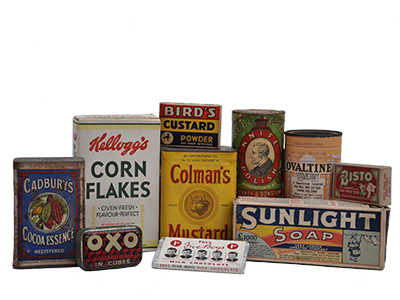 As a result many older brands have continued to use the manufacturer’s name to this day – Bird’s custard, Kellogg’s cereal, Gordon’s gin. In the days of the village shop or grocery store, the shopkeeper would recommend products and suggest new lines as they appeared. The customer would go to the store armed with a shopping list, and then the order would be made up while she waited. 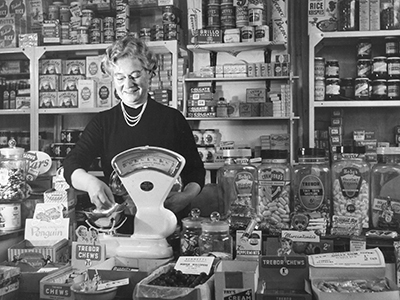 As the concept of self-service began in the 1950s and the boom in supermarkets took off in the 1960s, the consumer took an increasingly central role in choosing the product. Clear branding and visibility became essential. To enable the brands to “shout” from the shelf, pack design had to become bolder, brighter and more identifiable. The relaxing of post-war rationing and the rapid increase in personal wealth as Britain recovered from the wartime era of austerity led to growth in consumer power. At the same time technology was advancing at a white-hot pace and labour-saving devices such as fridges and washing machines became not only desirable but affordable. This had a big impact on how brands communicated, with brand owners changing their attention from posters to the emerging medium of television. The result was an increase in spending on advertising which in turn led to greater consumer confidence, so much so that Prime Minister Macmillan was moved to declare that we “never had it so good”. In this climate of choice and affordability, ever greater attention was being paid to communicating the attributes of brands. In the search for greater returns, the business of being the custodian of a brand required careful management. Successful brands were extended into new areas, such as the Galaxy name which is now used on products such as cakes, desserts and drinks as well as chocolate bars. A brand like Virgin has been successfully applied to a diffuse variety of services including air travel, finance, rail, media, books, music, soft drinks – even wedding dresses. In recent years, with the advent of an international marketplace, it was important that a single name be used across that market. This led to name changes such as Jif becoming Cif, Ulay becoming Olay and Opal Fruits becoming Starburst – all so that the products could become pan-European, even pan-global. Brand extensions do not always work – Sunlight soap did not translate into a soap powder and has since withered. In recent years the digital age has influenced brand names. A long name does not work as a website address, so when Grand Metropolitan merged with Guinness and Arthur Andersen changed its name, shorter names were adopted – Diageo and Accenture. The media explosion has also revolutionised the channels of communication between brands and their customers, creating a proliferation of options. The digital age provides a superb platform for engaging consumers in more specialised and targeted ways, allowing closer relationships to be formed, but can also mean that years of accumulated brand value can be quickly undermined with the rapid and wide spread of information. One thing we can be sure of. In a world of ever widening choice and complexity, we will continue to develop our own brands in our minds, using them to inform our choices. Meanwhile companies will continue to strive to build brands, in order to be our preferred choice, win our loyalty and generate growth. The mechanisms for building brands are also likely to remain constant, with an emphasis on adding value, continuous innovation, being different and communicating creatively and effectively. However, in a world where most products are of a high quality and good design, and consumers are awash with disposable income and are increasingly demanding, where will differentiation come in the future? We may expect an increasing trend for lifestyle products marketed to appeal to consumers’ self-image. Some car marques, faced with the fact that all cars are now reliable, seek to differentiate themselves according to the aspirations of their prospective buyers. Some advertising no longer shows the vehicle, relying instead on creating a style and aspiration which we will buy into. People are increasingly concerned not just with how a product functions but with how it is produced. The Body Shop and Virgin led the way in ethical approaches to their business and this is likely to become more widespread, influencing companies’ stance on subjects such as use of resources, environmental credentials, animal welfare and treatment of staff. Celebrity endorsement, something that has existed since the 1880s, may also increase in line with our fascination with the rich and famous, but instead of simply endorsing a branded product like Gary Lineker’s endorsement of Walkers crisps, the celebrities will increasingly be the brand. Madonna’s perfume, Elle Macpherson’s lingerie and Kate Moss’s clothing range are good examples. So brand guardians must continue to balance the needs for both innovation and consistency, to devise creative and engaging ways to communicate and build their products’ rational and emotional values, if they are to continue to earn our trust and loyalty. Want to learn more about the history of brands? Featuring over 12,000 original items from the unique Robert Opie Collection, discover how well-loved brands evolved through their creative use of packaging and advertising – and how we evolved with them. The history of consumer culture is revealed decade by decade in our ‘time tunnel’, from the naive charm of the Victorian era to the sophistication of today.